Theresa May's "sell the farm" deal went down in flames today. What's Next? The UK "Remainers" are cheering today's vote as if they have a chance at a second referendum. It's theoretically possible, but it's the least likely outcome. Once again, the default position is a no-deal Brexit. In the absence of any other agreement that the EU would accept, no-deal wins. In regards to point number 4, there are many choices: stay, leave with no deal, leave with May's deal, leave with a Canada deal, leave with a Norway deal. It is ridiculous to expect the UK to wait for the UK. And it is equally ridiculous to expect Parliament to offer a straight-up stay-leave choice when the majority of the MPs want to leave. As a theoretical exercise, it's possible for the EU to grant a lengthy extension, but they said they wouldn't. It's far more likely proponents of "remain" actually cause a no-deal Brexit by clinging to ridiculous hopes. Let's investigate more likely outcomes. Corbyn tabled a motion of no confidence. Unlike motions from within the party, there is no limit to the number of times he may try that tactic. Parliament votes on his motion tomorrow at 7:00 PM local, 1:00 PM US Central. Corbyn will likely will lose. The reason is DUP will not want to put Labour in charge, and will thus back May. 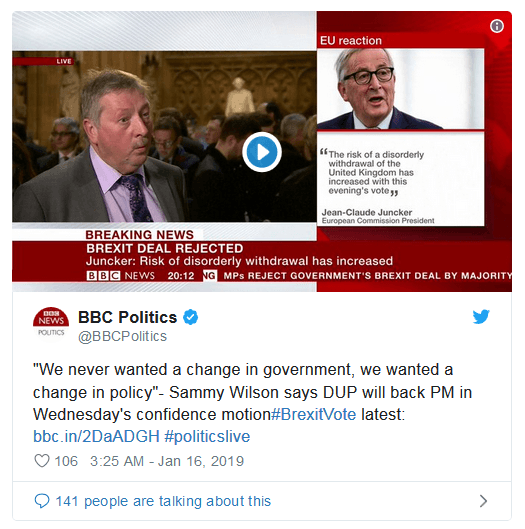 DUP does not seal the deal as it is possible all the opposition parties could vote "no" along with enough Tories remainers who would be willing to risk an election. If there was a "no confidence" motion, the Tories would have 14 days to find someone who could muster a majority, and it would have to be a majority that DUP would support. May could resign tomorrow, and she should, but that too is unlikely. If she resigned, Tories would have 14 days to find someone who could muster a majority, and again it would have to be a majority that DUP would support. If no such candidate could muster a majority, then there would be elections. Elections are possible, but it's unlikely the EU would grant a lengthy Brexit extension. If not, then a no-deal Brexit would win out. 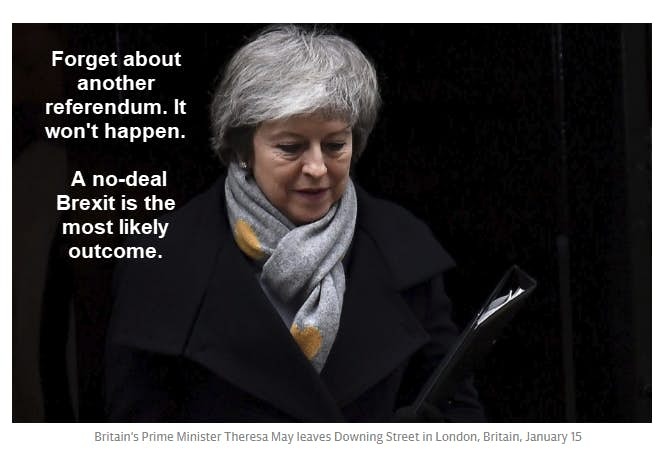 No matter how one twists and turns, a no-deal Brexit is the default option. If at some point a majority for a Norway deal surfaced, DUP could scuttle it by siding with Labour in a motion of no confidence. Corbyn would likely chomp at the bit. That would again take us back to this pertinent point: Tories would have 14 days to find someone who could muster a majority, and it would have to be a majority that DUP would support. The above complications all point to May being outed and replaced by Johnson, who wants a hard Brexit. Alternatively, May could finally get her way on the pathetic deal she negotiated. The only wildcard left is the EU. If the EU offered a hard guarantee there would be no permanent backstop, May's deal could potentially garner enough support. Given what happened today, and based on the above analysis, a no deal Brexit is the most likely state of affairs, one way or another. Many paths lead to a no-deal outcome. There are too many possibilities to say no-deal is likely. Rather, it's the most likely option of the bunch.